Finn McBride (Peter Dinklage) is a dwarf. In the course of the movie, only two people don’t make some noise of surprise or some rude comment about his stature, so it’s understandable that Finn just wants to be left alone. Living in Oblivion, in which Peter Dinklage rails against the director for using dwarfs in dream sequences. He opens the movie as a clerk in a hobby store that specializes in model trains. When the owner dies, Finn inherits an abandoned depot in a small town in New Jersey. The station is perfect for Finn, and he moves in. Before he can even hang his mailbox, he’s besieged by Joe, an outgoing hot dog vendor (Bobby Cannavale) who sells coffee outside the depot. Then Olivia (Patricia Clarkson), the crazy driver of the SUV that almost ran him down shows up with an apology and a bottle of wine. It seems Finn won’t be able to retreat as fully as he had hoped. The story takes several turns, but mostly it follows Finn as he settles into his new community. 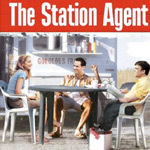 The Station Agent shows how effective proximity can be in creating new friendships. And while there are some uncomfortable moments where strangers make rude comments to Finn, or the friends make fools of themselves, these don’t detract from the movie’s engaging, kind heart.